Looking for simpler ways of adding variety to your classroom, try changing up the way things are done with Class Meetings and Student Lessons. Class meetings are a way for teachers to allow students to take charge of their learning and environments, and be held responsible. It also promotes a sense of community. 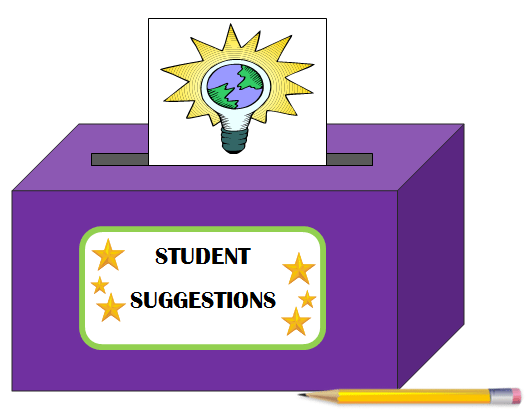 Example of a student suggestion card to use for your suggestion box. Great idea is to print them on 5 x 8 index cards and/or make them into note pads. This is just a small presentation to get you started and assist with present this topic idea to your students. For this idea, you would put the day’s lesson topic or chapter to be covered on the board. Allow students to go through the textbook or other resources to highlight the important/relevant information that they would like for you to present in the class. You may even allow students to suggest one project and/or activity to do to help them better grasp the lesson’s concept. These ideas don’t require any extra resources on your part and can be easily incorporated whenever you feel the need. Have more ideas that do not require additional resources? Share below or in the forum under Adding Variety to your classroom.